Tags: 2018 WSOP, Arne Kern, Samad Razavi. Attracting a field of 7,361 total player entries, the third biggest field in the event's 6-year history, this year's WSOP #21 $1,500 buy-in NLHE Millionaire Maker created a huge prize pool of $9,937,350. The one who ended up with the lion's share was given to Arne Kern of Germany, who earned his first-ever WSOP gold bracelet and the sweet pot of $1,173,223. A 26-year-old student, Kern has won the biggest score of his career as a poker player, and this win amount is actually 40 times bigger than any other live tourney cash he had previously made. With 17 players remaining, Kern entered the final day of the event as 11th in chip position. The humongous field included some recognizable names in poker who made it to day 4 of the event including the likes of 2017 Triton Super High Roller Series main event champ Manig Loeser, 2013 WSOP Circuit $365 NLHE Event #6 champion Ralph Massey, two-time bracelet winner Barny Boatman, and 2015 WSOP $3K 6-max NLHE champion Justin Liberto. The final heads-up match saw Sam Razavi versus Arne Kern, and in the end the title and the pot went to Kern as he made a flush draw. 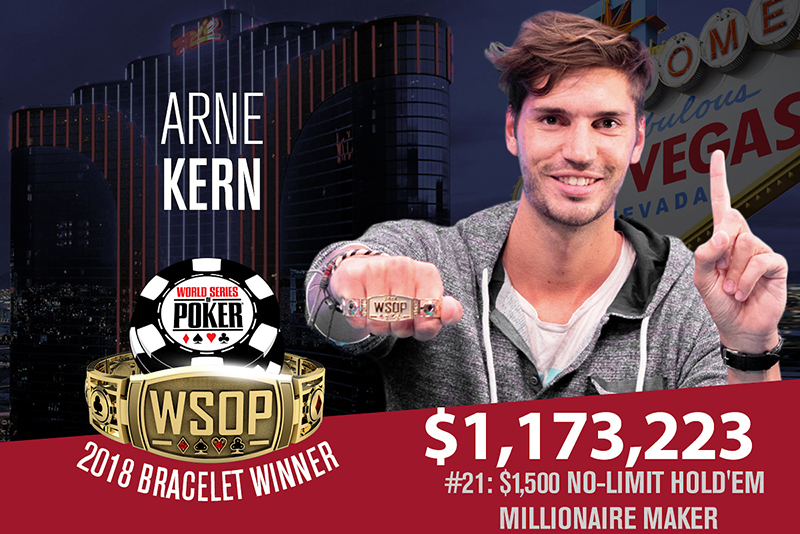 9 comments for "2018 WSOP: Event #21: $1,500 No-Limit Hold''em MILLIONAIRE MAKER won by Arne Kern for $1.1 Million"
This german Arne Kern is a happy man, in this moment of glory, because he won a big sum and a nice WSOP bracelet. Has made a very good tournament and ended the game with a flush draw. He will remain with some beautiful memories. Congratulations for Arne K. because he managed to beat 7,361 players and to win this tournament. Like the tournament name specifies. Millionaire maker. For only 1500 USD buy in the winner got a bit more than one million. big congratulations on such a win with great first prize and huge number of players,like its main event at wsop!to beat so many players its great thing for him and now he can enjoy at main prize over 1,1 million dollars! well actually I have never heard of any of those dudes at the final table, but have to agree with some of the comments above me written by fellow mobbits and mobbelittos that to turn 1.5k into 1.1 million of dollaros is quite an achievement. 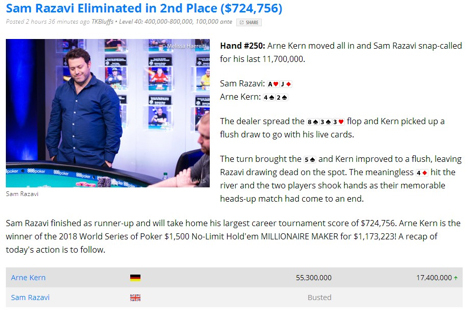 Absolutely gigantic congratulations go out to German poker professional Arne Kern for being crowned champion of the MILLIONAIRE MAKER tournament. Winning over a million dollars. 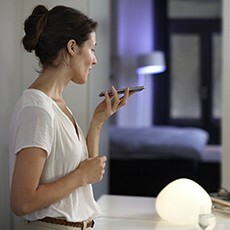 That's totally incredible.